U.S. President Donald Trump, applauded by U.S. metal workers, is seen after signing a proclamation to introduce tariffs on imports of steel and aluminum, at the White House in Washington, March 8, 2018. President Donald Trump's decision to slap punishing tariffs on Chinese goods may prove to be a blessing in disguise for China, even as it prepares to retaliate, analysts said. Trump’s trade offensive also has huge implications for the European Union and other countries, and that is making it impossible for the Western world to jointly counter Beijing’s protectionism in areas where they see eye to eye. Until recently, Western countries and Japan, were working on measures to fight back what they consider China’s dumping of low-cost goods and theft of intellectual property rights, but now they have had to suddenly change their priorities as they focus on responding to Washington’s actions. In December, trade ministers from the European Union, Japan and the United States issued a statement pledging to enhance “trilateral cooperation” in the World Trade Organization and other organizations to fight against China’s state-backed market disorienting trade practices. 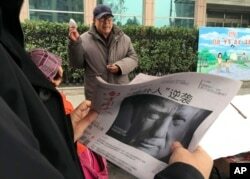 FILE - A man holds a Chinese newspaper with a front page photo of U.S. President Donald Trump at a newsstand in Beijing, China, Nov. 10, 2016. China has pledged to "firmly defend its legitimate rights and interests" in response to metal tariffs intruduced by the Trump administration. Jacob Kirkegaard, a fellow at the Peterson Institute of International Economics told VOA the new situation is “clearly beneficial to China.” And the likelihood the West could work together to confront China on its protectionist measures, be it IPR (intellectual property rights) thefts or forced technology transfers has been diluted, he said. “There is no doubt that the splitting the OECD (Organisation for Economic Cooperation and Development) or Western camp on trade disputes, because of the unilateral decision of the Trump administration is a benefit to China,” Kirkegaard said. The situation has taken such a dramatic turn to the point that European politicians who used to be riveted in their focus on China are now finding it more rewarding to be seen as leaders who can stand up to the Trump administration. Recent outbursts in European capitals against Trump’s trade actions also bear out this scenario. After meeting with U.S. Trade Representative Robert Lighthizer last weekend, EU trade commissioner Cecilia Malstrom said this about Trump’s actions, albeit without mentioning the United States directly. “Recently we have seen how it [protectionism] is used as a weapon to threaten and intimidate us. But we are not afraid, we will stand up to the bullies,” Malstrom said at a conference Monday in Brussels. A worker sorts hot red steel at a plant in Zouping in China's eastern Shandong province, March 5, 2018. “China won’t allow itself to be trampled upon," said a recent editorial in an official Chinese newspaper after the Trump administration slapped import tariffs on steel and aluminium. Analysts are asking if Washington can save the EU and Japan from being targets of its trade actions and focus them only on China. That would help revive a Western alliance against Chinese protectionism, they said. But at this point, Balding believes that is unlikely. “He [Trump] is very good at confrontation, but he’s less skilled in creating, building and nurturing political alliances,” he said. China may take advantage of the rising protests against Trump’s actions in the European Union, but it will also plan its own retaliatory actions. Whether threats of retaliation will force the U.S. President to rethink his strategy, is also another important question. Analysts said he would not stop, even if it means facing flak at the WTO. In fact, the effectiveness of the global trade body may also be put in serious question if Washington continues to ignore its rules, analysts have noted. At the core of Washington’s move is the use of national security as a justification for imposing the latest round of tariffs on steel and aluminum, instead of making a case about dumping goods and subsidies. Kirkegaard said that if this is the path Trump continues on, that justification could be used to put up barriers against a wide range of goods that use steel or aluminum as components.